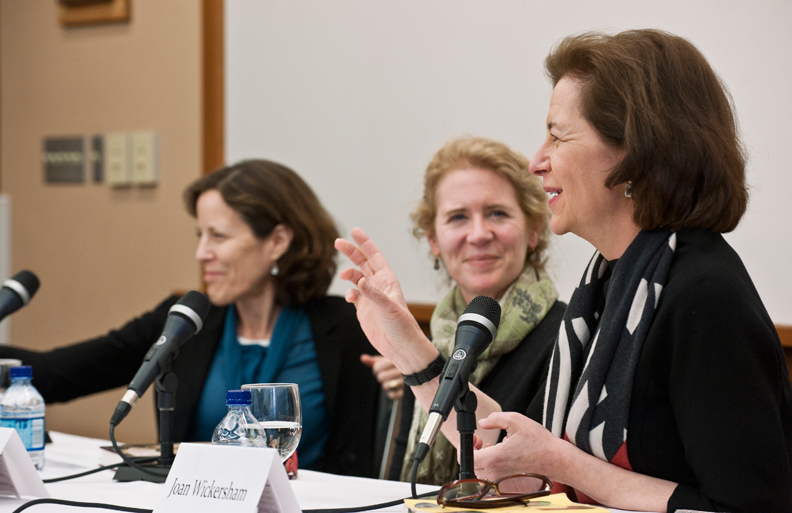 Memoirists Amy Boesky, Suzanne Berne, and Joan Wickersham shared their experiences of the costs and virtues of setting down a life on paper during a panel discussion titled “Why Memoir?” on March 23 in Devlin 101. Boesky, an associate professor of English, is the author of What We Have (2010), about her family’s hereditary history of breast and ovarian cancer. Berne, an adjunct faculty member in the English department, wrote Missing Lucile (2010), the story of the grandmother whose early death haunted her son, Berne’s father, throughout his life. Wickersham, a fiction writer and essayist, wrote The Suicide Index, a 2008 National Book Award finalist, in which she broached the trauma of her father’s suicide. All three writers were asked what drove them from their preferred practice of fiction and toward memoir. “Writers struggle until they find the right form for that story,” said Wickersham, who spent eight years on a novel about her father before scrapping it. Berne said that since her grandmother was virtually unknown to the family, fictionalization would be a disservice: “This woman was already fiction.” Boesky set out to tell her family’s particular story, but said she made a decision to employ novelistic techniques, such as thinking of her family members as characters and using exemplary episodes from a single year in their life. Pictured, from left, are Boesky, Berne, and Wickersham. This feature was posted on Thursday, March 24, 2011 and is filed under Featured Photo.